The WNBA is “refreshing” its brand for the upcoming 23rd season, set to tip off May 24. In an event coinciding with the draft, the league unveiled a new logo with a new primary color scheme and revamped uniform styles. The uniforms, with more prominent front team logos, will appear in games this year but the logo will wait until 2020 due to time constraints. It’s only the third logo in the league’s history and has drawn speculation as to who is the mystery player with the bun. The first WNBA logo in 1997 was based on the Jerry West-inspired NBA logo. The league changed it in 2013, going with a ponytailed player making a layup. The newest logo moves to the more common bun hair style and sleeker, more modern movement. ''They took the silhouette out of the box which is a massive breakthrough as she was perceived totally different,'' WNBA chief operating officer Christy Hedgpeth said at the event. ''She was free, there was more movement there, taking up more space. She's more athletic, longer physique. This is basketball on our terms. That was a phrase that really resonated with the players. That's really symbolic in that regard. The marketing firm insisted the logo is not based on any one player or an amalgam of specific players. They said they got input from players on what logowoman should look like, then did hundreds of sketches. That didn’t stop the WNBA from using a new logo and speculation to its advantage. Who do you think is the new #WNBA logo? Fans spent the week discussing hair styles and body types on Twitter trying to figure out which player is the muse for the silhouette. In an interview with The Undefeated, Kia Nurse and Sue Bird went the analytical route. Nurse, entering her second year in the league with the New York Liberty, said she’s been focused on it. “I was going through them, and one of them is my teammate [Kiah Stokes]. I’m like, ‘That’s not her.’ Then I said, ‘OK, she has a bun. …’ So it’s either Diana Taurasi or Elena Delle Donne. But Taurasi’s bun is quite sit-back and quite small. But Delle Donne has a bigger bun, so I’m not really sure. I’m just going crazy. Hopefully someone will tell me. Bird, the reigning champion with the Seattle Storm, isn’t as invested but knows how it will all likely go down. Diana Taurasi is the unofficial leader of the guessing game and as of early Friday afternoon, led the Twitter poll with 41 percent of the vote. 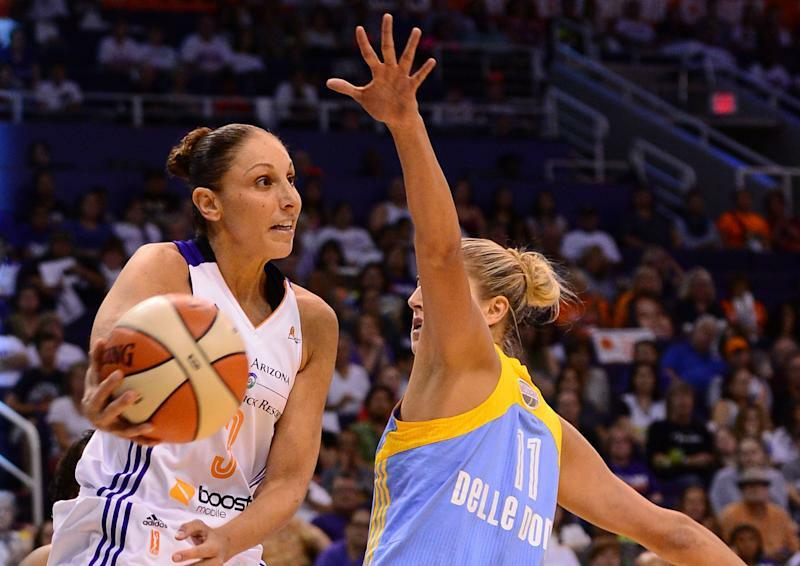 The 14-year veteran guard won three championship titles with the Phoenix Mercury, three with UConn and three Olympic gold medals with Team USA. The league’s all-time leading scorer since 2017 plays at 6-foot — a little more with the bun — and fits the bill for the logo. Taurasi’s bun is so iconic, it has its own Twitter page (which briefly became a fan account for Chicago Sky draft pick Katie Lou Samuelson, another bun wearer). One person tweeted the idea that it’s Taurasi making a pass, a symbolic gesture of the knowledge she’s passing to the league’s next generation. She’s the most experienced player the WNBA listed. Washington Mystics star Elena Delle Donne is 6-foot-5. The forward is entering her seventh WNBA season and averages 20.4 points and 6.7 rebounds over her career. Candace Parker has been with the Los Angeles Sparks for her entire 11-year career. Many fans have argued she can’t be the logo since she doesn’t wear a bun, but occasionally she’ll switch from the ponytail to it. And some pointed out her form matches. New York Liberty center Kiah Stokes, entering her fifth season, had only 4 percent of the vote Friday. A few fans pointed out her movement under the basket also matches the look. It could also be a long list of other players or more likely a combination. It’s almost certain we’ll never know. The fun is in little girls believing they can be the logo, no matter who it may have started out as.